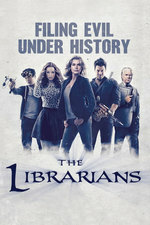 When Flynn and Baird are sucked into Baird's favorite classic film noir movie, the Librarians will need to perfect their sharpshooting and detecting skills if they're going to make it out alive. That was utterly fantastic and bonkers and looked like so much fun. Lindy Booth very clearly was having to bite her lip to stop from laughing when the space-villain was monologging. ...and Eve and Flynn finally getting to make out only for the scene to fade to black. Already watching it again. There are some great shots, lighting and cinematography in this episode too, e.g. Eve looking out of the window, but on the screen with iconic Hollywood lighting across her face. There's even a Wilhelm scream. Ha, yes, the Wilhem Scream made me laugh out loud when I heard it, but it had slipped my mind by the time I posted. And that Young Ezekiel credit had been erased from the IMDb listing for the episode and the actor’s page (Jonah Vollmar) , so, must be for a future episode.